I was very nervous about the birth of my second child. 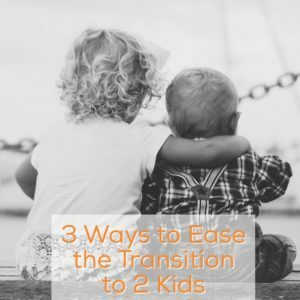 I had heard stories of how the transition from one to two children was much worse than the transition from zero to one. This was hard for me to imagine since my transition from no children to one colicky baby was a rough one. I knew that we would survive whatever was thrown our way, but part of me dreaded the first year of having two children. I saw friends struggle through the transition. I was one of the last ones in our circle of mom friends to join the Mom of Two Club, which meant that everyone else had their hands full with their own children & wouldn’t be able to help me much with my own transition. It also meant that I heard their difficulties & worried about what we might be up against. Luckily it also meant that I could watch & learn, & see what worked, what didn’t, & how quickly things seemed to get easier. Luckily I was blessed with a baby who did not have colic & was much happier than my first. Luckily I had an independent three year old who has a soft spot for his little brother. Babies love & desire attention. They are adorable & perfect & don’t get on your nerves as much as a toddler can. However, they do not understand you when you tell them that they are beautiful, or perfect, or cute, or amazing. But big sibling definitely understands. Of course, I always made sure that baby felt loved, & when big brother wasn’t around I gushed about how perfect he was. But it was important not to make my first son feel like he was completely dethroned & second best. Life gets much busier once you have two children. Days fly by in a whirlwind of feedings, naps, & diapers. There are dirty dishes, laundry, & vacuuming to be done. The first child can get lost in the chaos because they are more self sufficient. They might not get attention from mommy because the load of poop stained onesies need washed. But it is important to give that first child plenty of one on one attention. I tried my best to ignore other responsibilities & spend one on one time with big brother while little brother was sleeping. We had a lot of quality time playing games, coloring, doing puzzles, & just playing while the baby slept. Your first child has a huge role in their baby sibling’s life. They are role models, care takers, play mates, & teachers. You, of course, don’t want to force your child into a role of taking care of their sibling unwillingly; but you should encourage them to be a helper. They can grab diapers for you, they can bring snacks for everyone to share, they can play peek a boo with the baby while you make them lunch. You are the parent, but the sibling deserves responsibility in caring for their new baby too. My son loved this role, & it made him feel that he was still a very important part of the family. He takes his job as big brother seriously, & he is wonderful at it! The transition will never be perfectly smooth. There will always be mommy guilt & sibling rivalry. But having two children opens up the doors for new relationships & growth for every person in the family, & it can be an incredible experience!